"I predict that one day, moving pictures of cats will be immensely popular and cause a whole generation of people to have bad grammar and atrocious spelling. Now, may I finally have a Hamburg Steak on a Kaiser Roll? And put Cheese on it!" I like dogs. I prefer dogs that aren't small and yippee, but dogs are fine. I just consider them to be a lot of work. Cats you have to clean the litter box, sure, but with dogs, you have to walk them, pick up poop, let them out frequently, and they can't be left alone for a long time. I'll admit, I'm a cat person. I have two currently. And I've had cats pretty much my entire life. I grew up with them, and like the company they give. When I want to go away for a couple of days, I just leave them extra food. Dogs you have to arrange to be cared for if you leave them for more than half a day. I did have a dog growing up, and I loved him to death, but cats are perfect for someone like me. Lazy. If I want to just sit and veg, they are content to veg with me. And they keep me warm when I sleep. And they amuse me sometimes. For thousands of years people have kept cats. Some kept them purely as pets, but mostly, they were kept to keep rodents down. If cats roamed the barn, mice stayed out of the grain. It was the same for dogs, really. They were more workers and less pets. That's not to say people didn't love their cats or dogs. They did. But most people couldn't keep an animal around unless it performed a service. Which brings us to todays oddity. If you haven't guessed by now, it's about cats. Or, one cat in particular. For hundreds of years, sailors have kept cats on board their ships. They provided the sailors entertainment and companionship during their off hours. They also kept rats and mice out of the cargo and food supplies. These days, modern ships have other, more efficient methods to control the rodent problem. Still, some ships, including some countries naval ships, still keep a cat or two around for traditions sake. 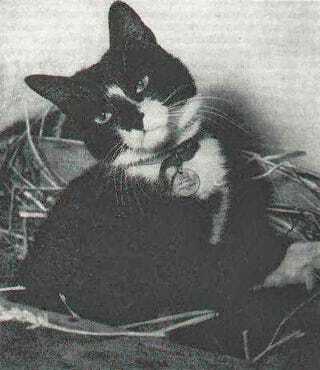 During World War II, an unknown sailor in the Kriegsmarine, Germanys navy, owned a cat, and kept it with him on his ship, the battleship Bismarck. On the ships first mission, it took part in a fierce battle that resulted in the Bismarck being sunk. Out of the 2,200 crewmen aboard, only 118 survived. 119 if you count the small black and white cat the British found floating on a plank amongst the wreckage. Yup, the very cat pictured above. Not knowing anything about the cat, the crew that rescued him decided to call him Oscar. (or Oskar, since he was German, after all). For the next few months, Oscar served with his new crew on the HMS Cossack. They sailed around the Mediterranean and North Atlantic escorting convoys. It was easy duty for Oscar. Until October. The HMS Cossack was attacked by a U-Boat and hit by a torpedo. In the explosion, 159 of her crew were killed. The rest of the crew, including Oscar, were transferred off the ship before it sank a few days later. The survivors were dropped off in Gibraltar to await their new assignments. Since Oscar had survived not one, but two sinkings, he was renamed 'Unsinkable Sam'. Since the first sinking he survived was that of the Bismarck, it was decided to reassign to another British ship that had taken part in that battle, the aircraft carrier HMS Ark Royal. Unsinkable Sam didn't live up to his name, however. Less than a month after the Cossack went down, his new ship was also torpedoed. Every effort was made to save the ship, but the damage was too great, and the HMS Ark Royal sank 30 miles off Gibraltar. Because of where the torpedo hit, and the slow nature of her sinking, only one sailor died. The rest made it to life boats. Sam was found by one of the rescue crews, floating on a plank again. His rescuer reported Sam was wet and angry, but otherwise unharmed. At this point, the British admiralty decided Sam had suffered enough. After a short stay with the governor of Gibraltar, Sam was retired from the navy. And he was sent to live out his retirement in a seamans home in Belfast. Sam never showed any signs of resentment at being forced to switch sides. In fact, he enjoyed a nice long life after he was retired. Sam passed away in his sleep in 1955. An oil painting of him is on display in Englands National Maritime Museum. If you don't like cats, thats fine. It's all a personal choice. But you have to admire a cat like Sam who didn't let a sinking ship beat him. Three times.